Catcher. Hits left, throws right. Second year of high school. Jersey number, 2. He is known for his sporty glasses. Miyuki became a regular as a first year player with his gutsy pitch calls and clutch hits. Most people find it hard to get along with him, because of his cheeky attitude and strong principles. However, that is not to say that his teammates consider him as unpleasant; as a matter of fact, they often seek his company and crowds into his dorm room. 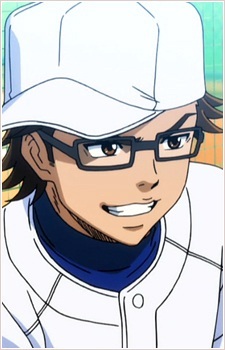 Miyuki enjoys calling the shots on the field, and is trusted enough by his teammates and coach to be allowed to do so. His dedication to being a catcher and wittiness is sure to win you over. Outside of baseball, he is also quite skilled in cooking and shogi.